The last couple of days have flown by, we started with interviewing the staff on Thursday. We interviewed four members of the staff discussing their backgrounds, their roles and how they see the youth center and its benefits for the children and the community. We were delighted to hear that the community is very involved in all activities and they are very happy to see some thing for the children in the community. They told us a little bit of the history and culture of Gende Tesfa (the area where we are working). As you already know we took over an old leprosy clinic, what you might not know (because I didn't) is that there is still a large number of people living in the community who are living with leprosy. Although it is a curable illness, there is still a huge stigma attached to those who have it. We also learnt that Gende Tesfa is one of the poorest and largest communities in Dire Dawa, most of the families live on less than €20 a month to provide for a family of up to 5. It is very hard for them to get work especially those who have leprosy.The staff invited us to visit the homes of some of the children who are benefiting from the youth center. When you drive into Gende Tesfa, there are a lot of bigger than average houses, but once you go behind these and see the reality of how people live, it is a whole other story. Many of the families live in dire poverty in small houses with one room for a large family, others live in squalor. The rest of the day was spent buying paint for the youth center (the hardest decision ever made) and playing with the children at the youth center. All in all it was a fantastic day, to get out into the community and meet them was fantastic. 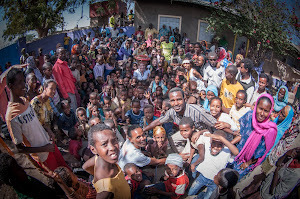 Once again I am overwhelmed by the people in Ethiopia, their kindness, their hearts and their resilience. Today just proved it once again, the Ethiopian people are some of the most amazing people you will ever meet!